Action from Bexhill Town's 2-0 win at home to Crowhurst on Saturday. 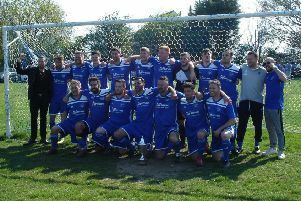 All three newly-promoted sides claimed victories in the Macron East Sussex Football League Premier Division on Saturday. Eastbourne Rangers made it four points and two clean sheets from their opening two matches by edging out Battle Baptists 1-0 thanks to an 85th minute winner from Tony Russell. Bexhill Town made it two wins out of two by beating Crowhurst. Old Hastonians started their league campaign with a 5-1 victory at Rock-a-Nore. A David Hand hat-trick, and one apiece from David Pugh and Tom Cusden did the damage for the Stones. Ashley Spice scored the Rocks' consolation. Two goals from Gary Hempe and a late strike by 16-year-old Jordan Cole helped Sidley United beat Hawkhurst United 3-2 in a match featuring three penalties. Robertsbridge United pulled off the biggest victory of the top flight season so far with a 5-0 win at home to Westfield II. Guy Ballard bagged a hat-trick, and there was one apiece for Adam Hardy and Paul Barnes. The early pacesetters, though, are Hollington United, who made it two wins out of two with a 1-0 victory at St Leonards Social. Midfield action from the Division One game between Bexhill Town and Crowhurst. In Division One, Rye Town are setting the early pace on goal difference following a 5-1 victory at Icklesham Casuals. Charlie Stevens (2), Robert Wilson (2) and Richard 'Alfie' Weller netted for Rye, while Val Newman pulled one back for Icklesham. Bexhill Town also have six points out of six after 17-year-olds Ross Cook and Ben Cornelius scored in their 2-0 victory at home to Crowhurst. Herstmonceux are the third team in the second tier yet to drop a point. Goals from Ashley Hawkins, Vince Rembridge and Stephen Prodger enabled them to defeat Mountfield United 3-0. The day's other two Division One matches ended all-square. Wadhurst United and Northiam 75 drew 2-2, with Ryan Bateman and Edward Clark on target for Wadhurst. Bexhill Town and Crowhurst battle it out at Bexhill Road. Little Common II drew 1-1 for the second weekend running, this time away to The JC Tackleway. Dan Estherby scored for Common and Joseph Powell for Tackleway. Three teams also have six points from two matches in Division Two. Peche Hill Select have the edge on goal difference after Martin Godden's double clinched a narrow 2-1 victory at home to Westfield III. Billy-Jo Driver replied. Hastings Athletic made it two wins and 10 goals with a 5-2 success at home to Ticehurst. Goals from Darren Nicol and Leon Fisher were not enough for Ticehurst because Sam Roberts (2), Jan Bailey (2) and Tyler Heasmer won it for Athletic. Hastings Rangers came from behind to beat Bexhill AAC 3-2. Rangers scored through Marc Barry, Mark Blanche and Joe Harmer, with Alex Williams and Charlie Mackay on target for AAC. Mayfield are the other side on six points, although their second victory came without even kicking a ball as opponents St Leonards Social II failed to raise a side. Burwash got their season off to a flying start with an emphatic 9-3 win at Eastbourne Athletic. A Paul Steed hat-trick, along with goals from Mark Pickles (2), James Rose (2) and Kieren Martin (2), did the damage for Burwash, while James Hanoman, Will Brooke and Jake Lambert scored for Athletic. Pebsham Sibex and Catsfield have six points out of six in Division Three. Sibex made it 11 goals in two games with 5-2 victory at Punnetts Town thanks to second half goals from Jared Beaumont (2), Sam Cherry (2) and Lee Paine. Catsfield are yet to concede a goal after defeating Hollington United II 2-0. Like Sibex, Sedlescombe Rangers II also left it until the second half to score five in their 5-0 win at home to Bexhill United II. Gavin Moffat Bailey (2), Gary Underhill, Kye Phillips and Martin Moss all scored after the break. Hailsham Athletico came from behind to beat Battle Baptists II 2-1. Adam Robinson gave the Baptists a first half lead only for it to be cancelled out by goals from Jake Barker and Perry Hodgkinson. Like Athletico, Bexhill Rovers picked up their first points via a 4-1 victory away to Orington. Adam Beeching, Iain Stewart Powell, Casey Ham and Karl Platel were on target for Rovers. Danny Firth struck for Orington. Hawkhurst United II are the only team with a 100% record in Division Four. Their 3-0 home victory against Bexhill AAC II gave the Hawks six points out of six. Sovereign Saints, West Hill United and Mayfield II are all unbeaten with four points. Goals from Jimmy Kiteley (2), Max Appleton, Thomas Wilding, George Sambrook, George Wheeler and David Wilson gave Saints an 8-0 victory over The JC Tackleway II. West Hill ran out 5-3 winners at home to a Magham Down side which opened the scoring. Ayrton Ellis (2), Godswill Chukwuemeka, Jamie Britt and Danyal Aldous scored for the hosts, with Magham Down responding through Jamie Bundy and Graeme Whiteman. Goals from Richard Spooner and Stephen Gillett saw Mayfield win 2-1 at home to Parkfield. Victoria Baptists opened their account by beating Sandhurst 4-2. Andy Turner scored for Sandhurst. Wittersham II pulled off the biggest win of the season so far with a 9-0 victory at home to Northiam 75 II in Division Five. Chris Catt claimed four of the goals, with Ben Andrews (2), Luke Andrews, George Randall and Kiran Monk completing the scoring for the early leaders. New boys Bexhill Broncos also have two wins out of two after winning 5-4 in a nine-goal thriller away to Battle Baptists III. Goals from James Downs (2), Ben Sadler (2) and Jack Harman preserved the Broncos' 100% record, while James Crouch, Anthony Hickman, Liam Smith and Chris Wakeford netted for Battle. Bexhill Spartans celebrated their first win in the league with a 4-2 success away to Icklesham Casuals II. A George Brooks hat-trick and a Jack Harris strike got Spartans up and running. Robertsbridge United II also got off the mark for the season by edging out Cranbrook Town 4-3. Shane Norman, Elliot Head and Ben Cooper claimed the Cranbrook goals, but a Guy Ballard hat-trick and one from Thomas Charter won it for Robertsbridge. West Hill United II picked up their first points by coming from 2-0 down after 20 minutes to win 6-3 at Sedlescombe Rangers III. A Mike Hawley hat-trick, Perry Leddy brace and one from David Burch completed the turnaround. A depleted Ore Athletic side lost 5-0 away to Mid Sussex League outfit Balcombe in round one of the Sussex Intermediate Challenge Cup after playing the final 80 minutes with 10 men.